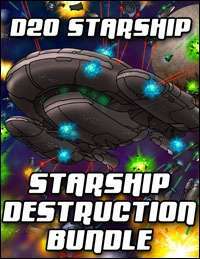 Tactics of Starship Destruction is build on the concept of providing all new starship maneuvers that can be used in combat in addition to those listed in the future starship section in the Modern SRD. These maneuvers are generally designed to be performed by starships, although stations can attempt some of them as well Ã¢â‚¬â€œ the specific aspects of station combat are explained further on. This 10 page PDF is just the sort of thing needed for GMs to add depth to any great d20 sci-fi or futuristic campaign world including Polymecha. This PDF also comes with a Futuristic Datafax that can used to record all the information on a particular starship. Written by Louis Porter Jr.